2nd lunar month of 1692: the name of Sawai Sonoemon was recorded in the hyôbanki "Yakusha Ôkagami", katakiyaku section. 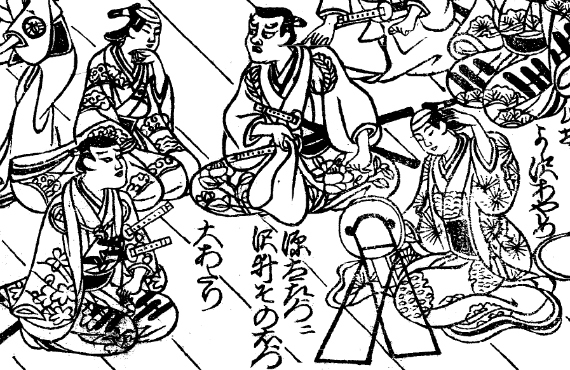 1st lunar month of 1695: Sonoemon performed in Kyôto at Hayagumo Chôdayû's theater in Chikamatsu Monzaemon's drama "Ima Genji Rokujûjô"; his stage partners are Mizuki Tatsunosuke I, Sakata Tôjûrô I, Yamatoya Jinbê II, Sodesaki Iroha I, Onogawa Ugenji, Matsumoto Rokuemon and Arai Hanzaemon. 1697: Sonoemon performed in Ôsaka as a katakiyaku in the theater managed by Iwai Hanshirô I. 1698: Sonoemon played in Kyôto the role of Sakagami no Ôji in the drama "Semimaru Nido no Shusse". 1700 ~ 1703: Sonoemon performed in Ôsaka. 1704: Sonoemon settled back in Kyôto. 11th lunar month of 1709: Sonoemon played in Kyôto the role of Iwakura Hikozaemon in the kaomise drama "Kokonotsu Kogura Hitotsubu Manbai", which was produced by Miyako Mandayû for the nadai Hayagumo Chôdayû. 3rd lunar month of 1710: Sonoemon's rank in the Kyôto hyôbanki, katakiyaku section, was jô-jô-(shiro)kichi (superior - superior - (white) excellent) [visual]. 11th lunar month of 1710: Sonoemon performed in Kyôto at Miyako Mandayû's theater in the kaomise drama "Gokoku Wagô Fumi Kotoba". 1st lunar month of 1711: Sonoemon performed in the same theater in the new year ni-no-kawari drama "Keisei Kuhonji Jôdo". 11th lunar month of 1711: Sonoemon performed in Kyôto at Hayagumo Chôdayû's theater in the kaomise drama "Tsurukame no Aimuko". 12th lunar month of 1712: Sonoemon went to Ôsaka, became jitsuaku and performed in the kaomise drama "Enmei Kobukuro", which was produced by Arashi San'emon III. 4th lunar month of 1713: Sonoemon's rank in the Ôsaka hyôbanki, jitsuaku section, was jô-jô-(shiro)kichi (superior - superior - (white) excellent) [visual]. 2nd lunar month of 1714: Sonoemon went back to Kyôto, switched to katakiyaku and performed in the kaomise drama "Tarôzuki Wakô no Ônuki", which was produced in Kyôto at Hoteiya Umenojô's theater by Nakamura Shingorô I. 3rd lunar month of 1714: Sonoemon's rank in the Kyôto hyôbanki, katakiyaku section, was jô-jô-(shiro)kichi (superior - superior - (white) excellent) [visual]. 3rd lunar month of 1715: Sonoemon's rank in the Kyôto hyôbanki, jitsuaku section, was jô-jô-(shiro)kichi (superior - superior - (white) excellent) [visual]. 11th lunar month of 1715: Sonoemon switched back to katakiyaku and performed at Hoteiya Umenojô's theater in the kaomise drama "Manpô Chitose no Matsu", which was produced by Yamatoya Jinbê III and included a kôjô commemorating the sudden death of Kataoka Nizaemon I. Spring 1716: Sonoemon played in the same theater the role of Setoemon in the drama "Keisei Sennin Kagami". No record afterwards. Sawai Sonoemon was a Kyôto katakiyaku actor, who was active from the beginning of the 1690s to the second half of the 1710s. He occasionally performed as a jitsuaku. He also occasionally performed in Ôsaka.